So it’s probably about time that we introduced a couple of new residents- Lady & Tramp. Lady is a little girl (if you hadn’t guessed) named after her mother. As the farm we bought her from, the owner kept referring to her as ‘Lady’s kid’, and I felt she was rather ‘lady’ like looking (she's the all white one with petite features). And so we had to have ‘Tramp’. Both are ‘meat’ cross breeds. Tramp is more obviously a ‘Boer’ (by the colouring etc.) They had hoped to breed from him, however as he developed they realised he had an under developed ear (actually this is true of much of the one side of his face). Therefore they castrated him, so Tramp is a ‘wether’. I have been asked a few times in the last week, whether we intend to milk our goats. Personally the idea of have homemade goats cheese is very appealing. To milk any mammal that animal has to produce young. 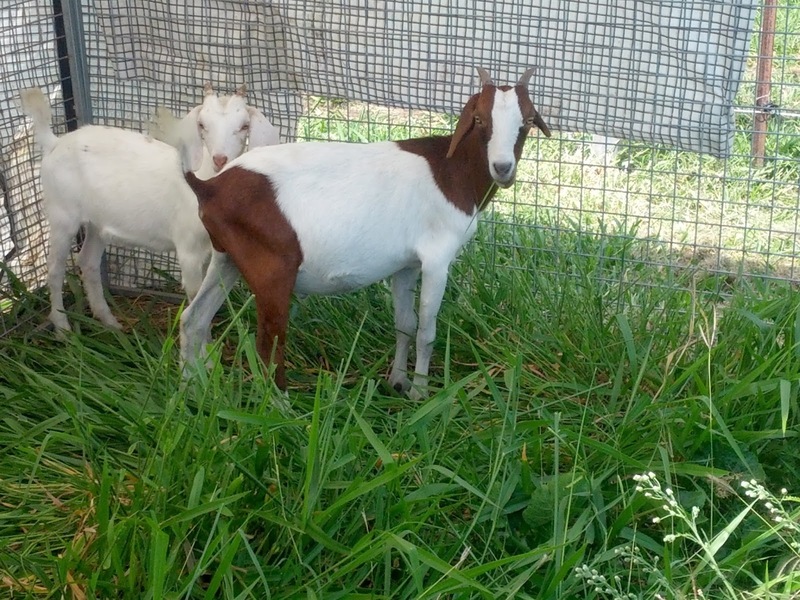 So (at this stage) we are not intending to milk our goats; as we will not be breeding them. Our goats are intended for meat, as with most farmed animals some breeds are better suited for either produce or consumption. (Poultry there are egg production verses meat varieties, cows would be dairy or beef etc.) But just because they are more suited to one source does not mean they cannot provide the other, just in this instance we have a female and a wether (castrated male). We purchased a wether over a whole billy/buck for a few reasons. 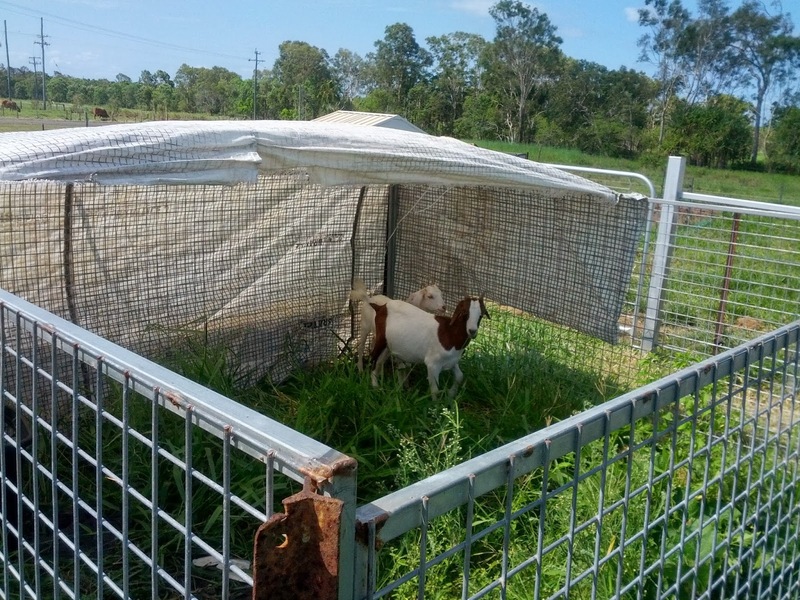 Firstly we want to see how our goats progress here. In terms of space, feed and interaction with our other animals- dogs, bird etc. Feed is a big issue, as whilst we are a smallholding, it is not a very large property. And as with all our livestock we have to factor in their health and wellbeing, as well as costs for supplementary feed, should our plot not provide a sufficient amount. So whilst they were purchased for ‘fattening up’ over the wetter months- so glorified lawnmowers whilst the foliage is abundant. Goats are (surprisingly) not natural grazers. And our research has found they are far happier foraging, than eating grass (or pellets for that matter). So at the moment we are utilising them to manage a few unruly areas. Another issue that we intend to monitor is smell and noise. So far they have been rather quiet, quieter than expected. As for smell, so far we haven’t noticed any unpleasant odours; goats have a bad rap for being smelly. Some of our neighbours keep goats and this does not appear to be an issue. Although it does mostly appear to be a male thing- one of the reasons for starting with a wether. Particularly during their mating season; intact billies/bucks urinate upon their selves, amongst other things. I have also read that it’s not advisable to keep males and females together full time and that they are capable of mating from 2 months old. So require separation from a young age and the males then require companions too. So if we did decide to breed our girl (or possible future stock) then it maybe a case of hiring/visiting a stud. So for now we are just experimenting with what they will eat and attempting to gradually get them used to us and our other animals. So far they have knocked over the grass in the cattle yard- where we have had them penned for the past week. They have made short work of the hay bale and some tree and vine clippings, bread, molasses meal all of which they seem to prefer to goat pellets! 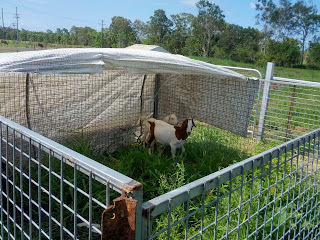 So on Sunday we transferred them to a smaller temporary pen, that we intend to move around the vine garden to begin with and later the house garden in general. Eventually we hope to tether them to a house of their own, but this will depend on how they interact with the dogs.